“I Hear Music” is a music video that shows off exactly what happens to any listener when they hear the heavy riffage of Only Living Boy. The clip starts in black and white as the boys jump into a moving pickup truck and race to town. On their way, the rockers encounter several townspeople who look like they might need a little face melting to spruce up their day. To remedy the situation, the band throws headphones at the bystanders, and as each listener puts them on their head, their life turns to color and their hips start to gyrate! A word of warning, folks: “I Hear Music” has a tremendous guitar solo that might be so Hendrix and hot, you’ll need gloves to remove the tape/DVD/file from your machine afterwards. There’s nothing like hearing a fat Fender buzzing and cutting through the mix in today’s world of bands relying on cheap synth tricks. We love rock and roll, and we love Only Living Boy. If you’re a fan of one, you’ll be a fan of the other. Programmers, throw some shred into your playlists this October and November with “I Hear Music.” We’ve got copies of Hide Nothing for you to get your hands on, so reach out for any requests. If you need more info, call Andy Gesner at 732-613-1779 or e-mail us atinfo@HIPVideoPromo.com . 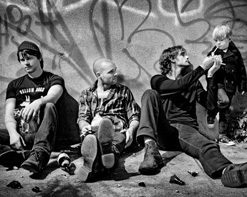 You can also visit www.onlylivingboy.com to find out more about Only Living Boy and all the tour dates near you.